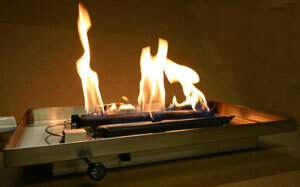 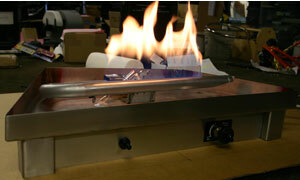 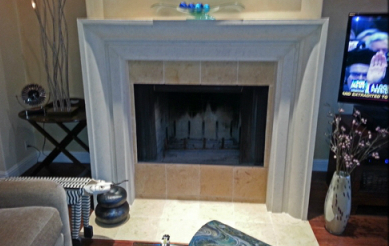 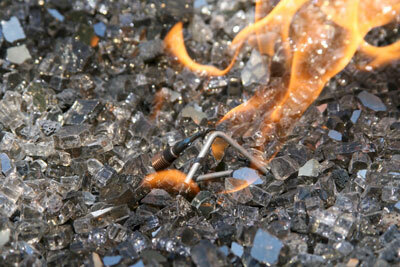 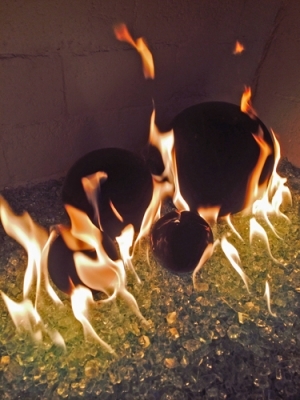 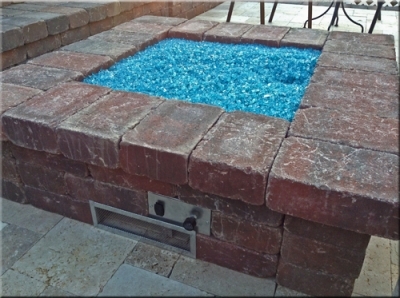 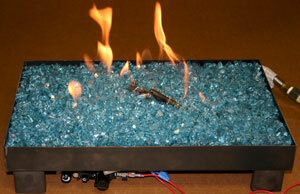 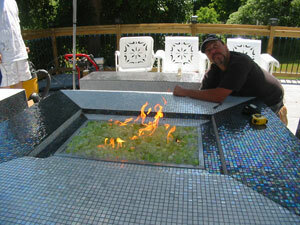 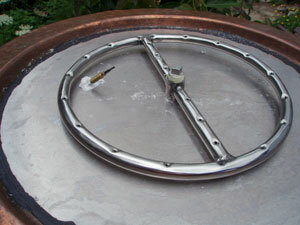 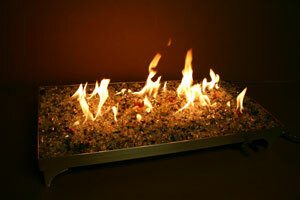 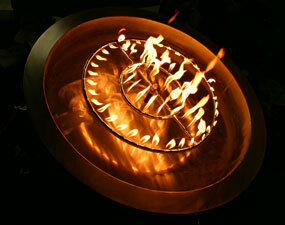 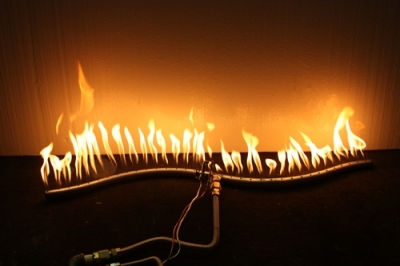 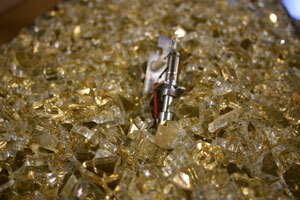 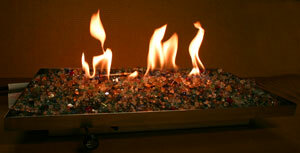 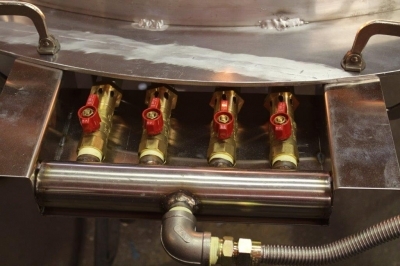 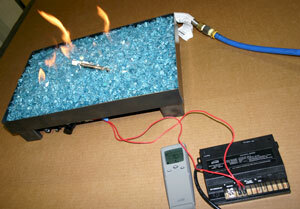 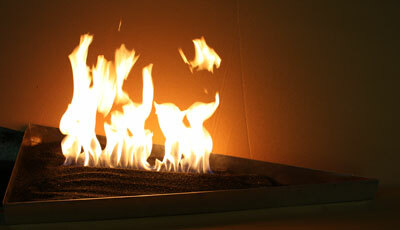 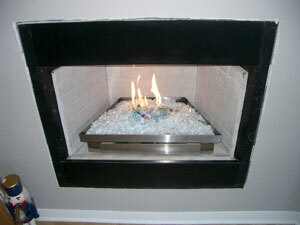 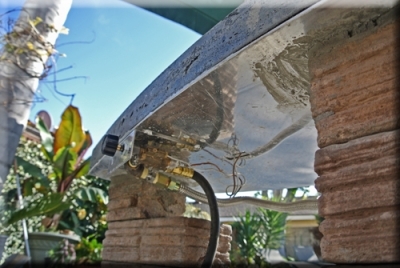 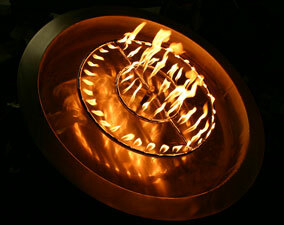 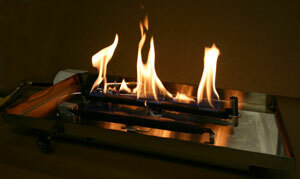 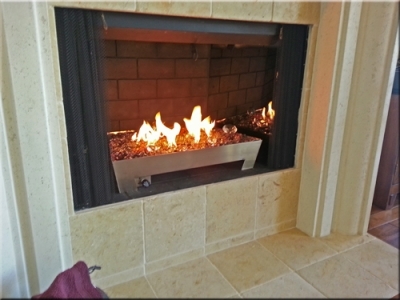 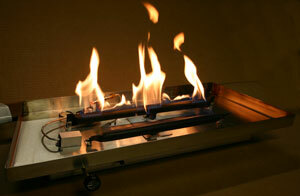 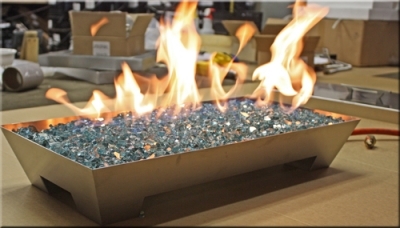 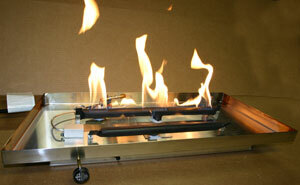 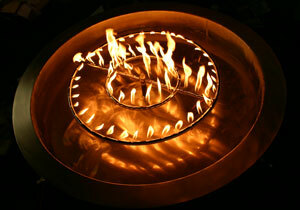 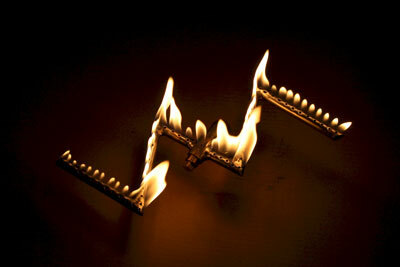 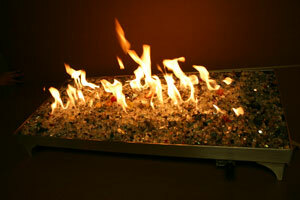 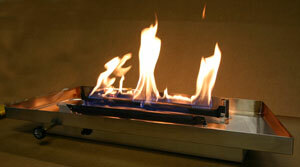 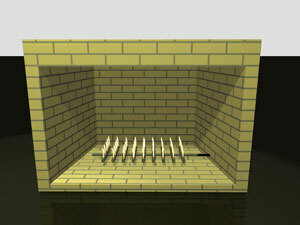 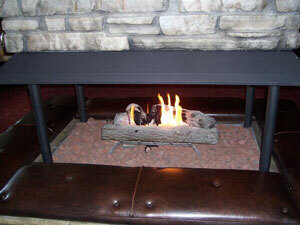 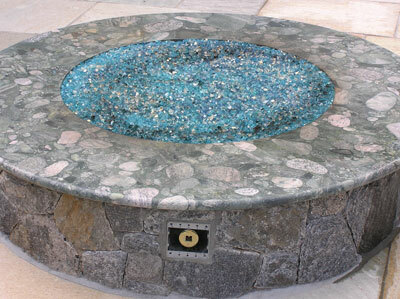 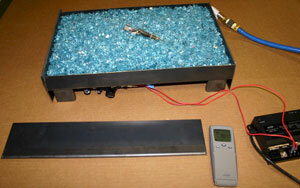 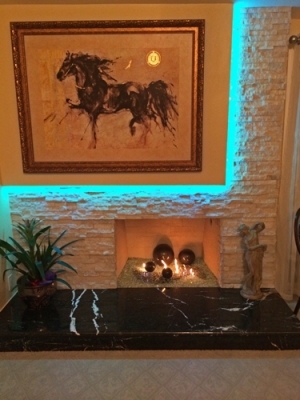 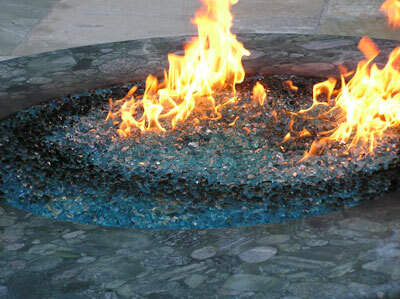 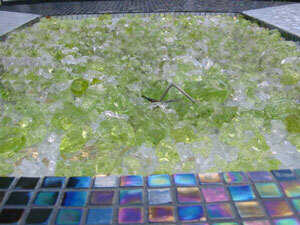 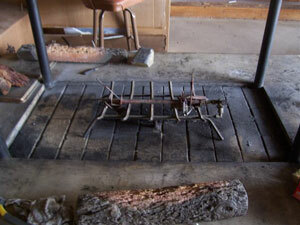 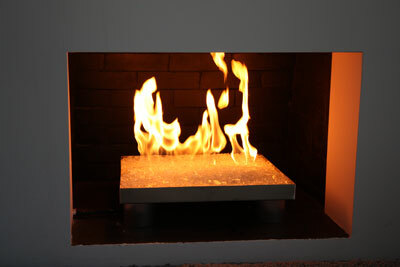 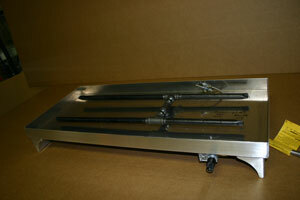 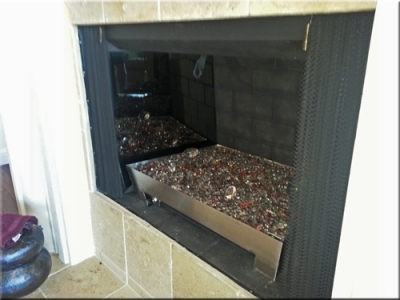 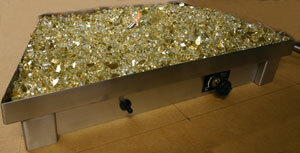 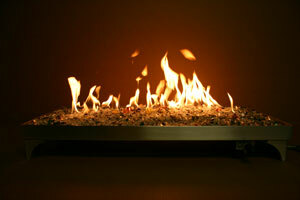 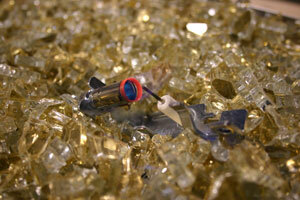 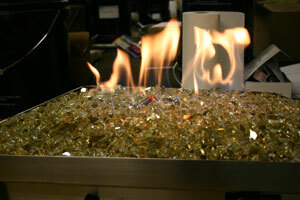 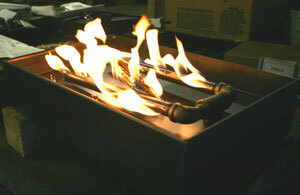 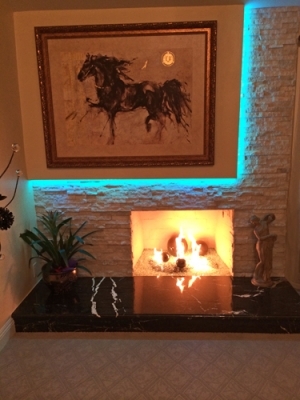 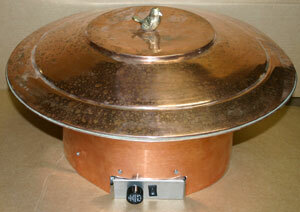 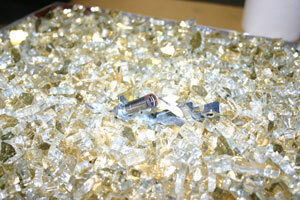 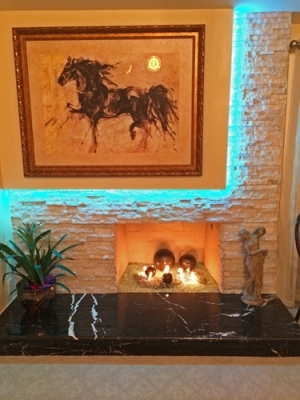 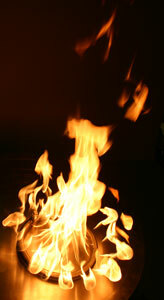 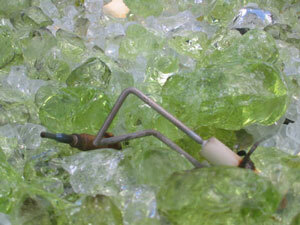 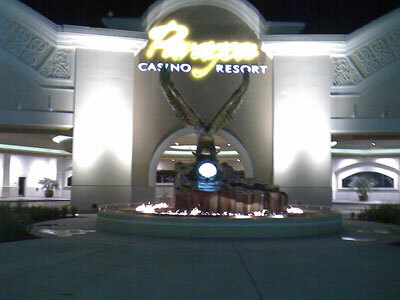 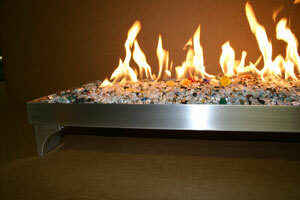 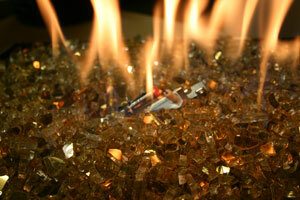 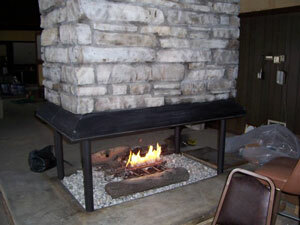 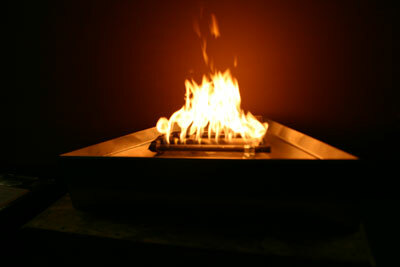 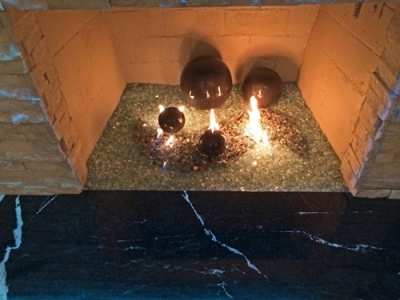 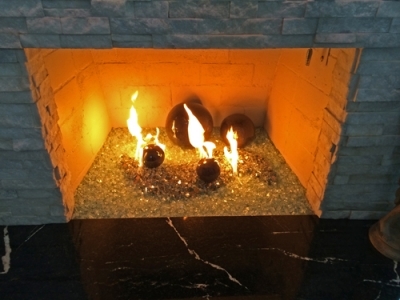 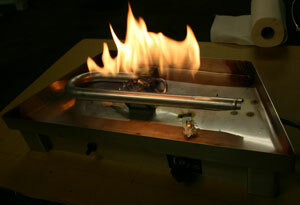 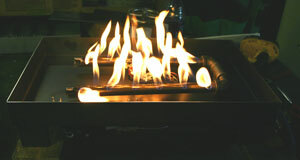 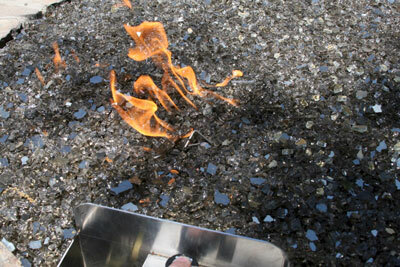 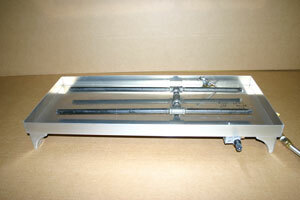 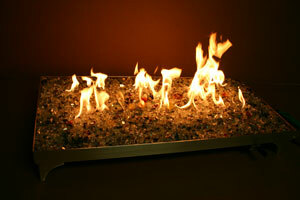 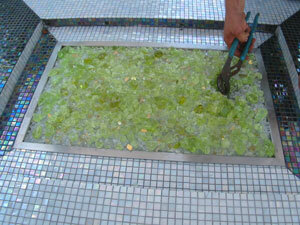 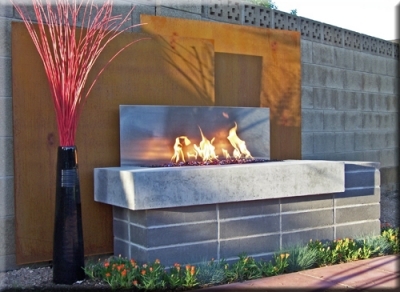 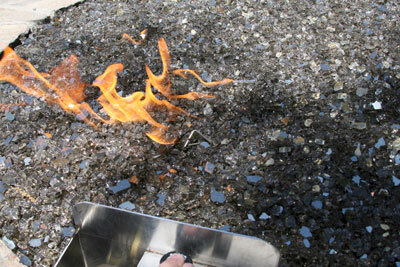 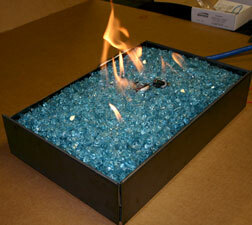 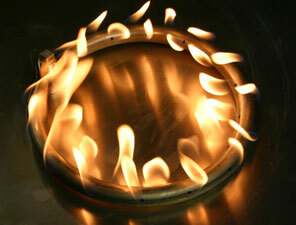 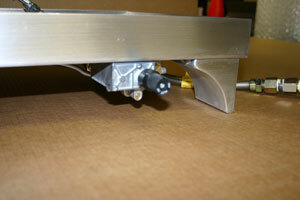 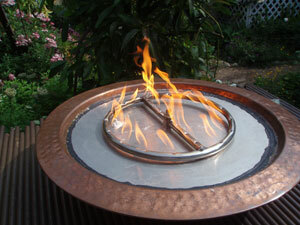 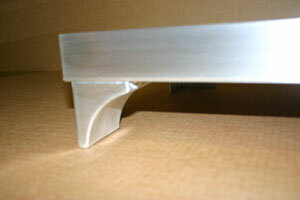 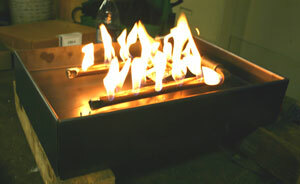 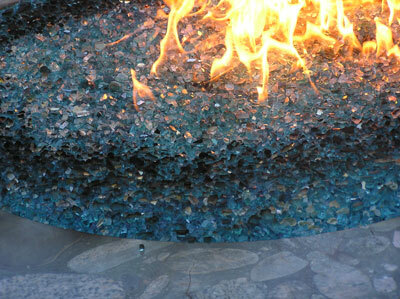 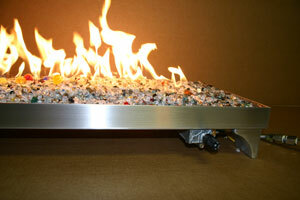 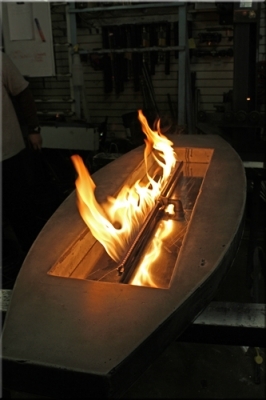 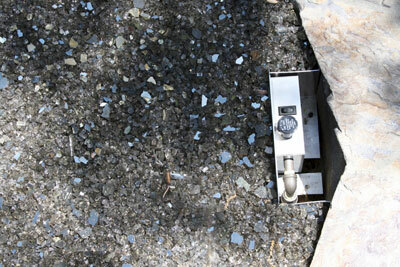 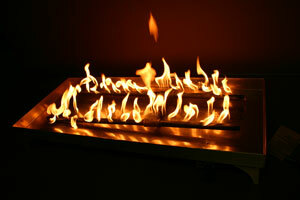 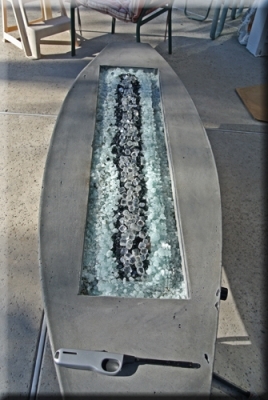 Our Propane Burners are manufactured to be used with Aquatic Glassel/fireglass. 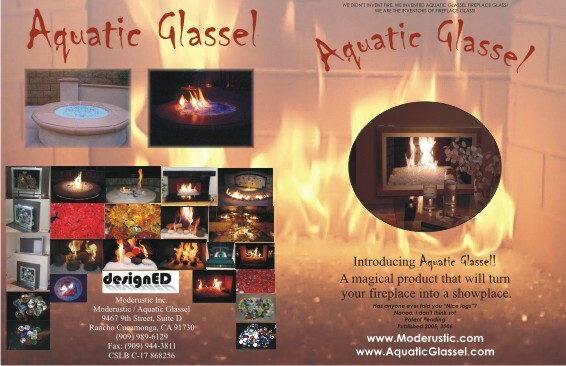 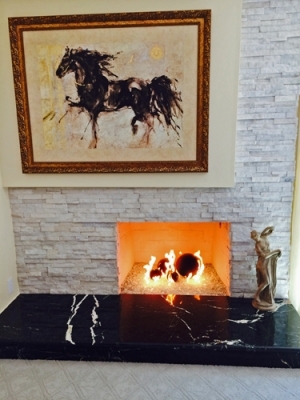 We are the only company in the world successfully offering custom made propane burners that safely burn Aquatic Glassel / fireglass. 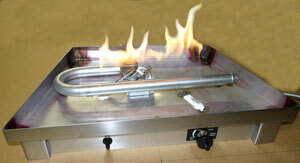 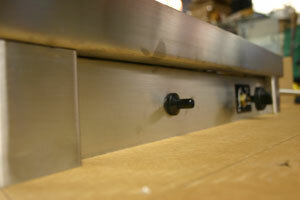 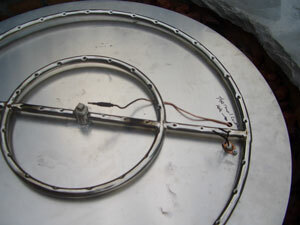 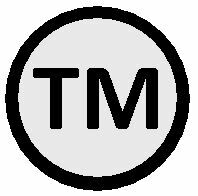 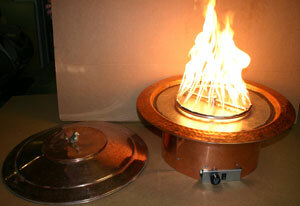 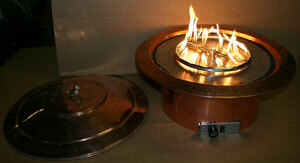 NOTE* We do not currently Sell Propane Burner kits online. 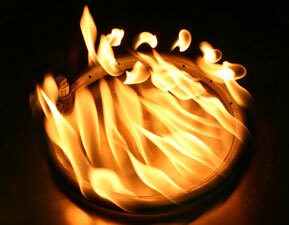 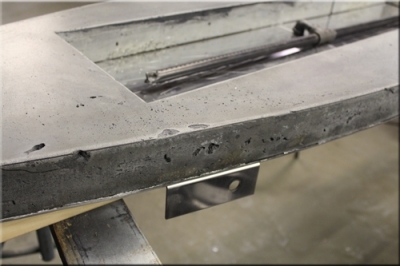 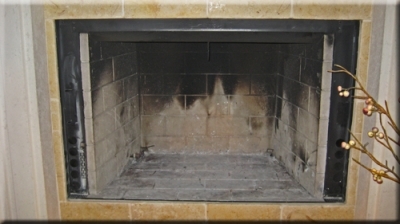 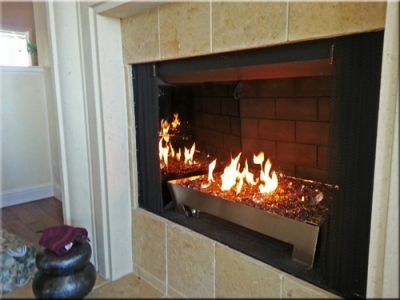 Please call us for a consultation as their are a lot of safety issues that must be dealt with before we can sell you a propape burner (909) 989 6129. 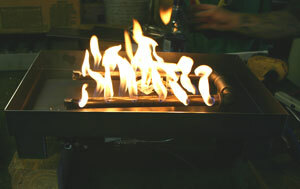 There are a lot of aspects of working with Propane please Click Here to Find out More. 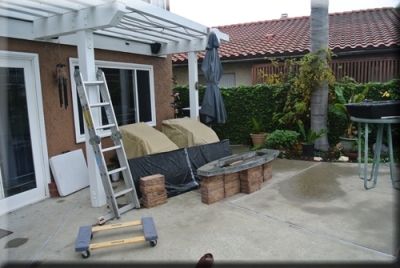 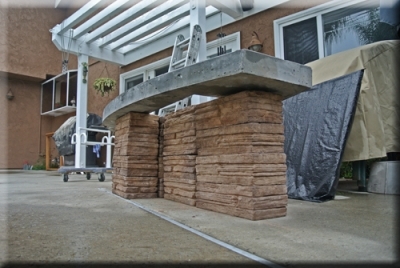 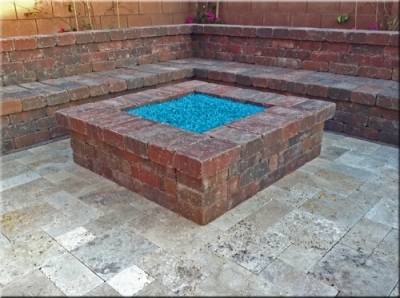 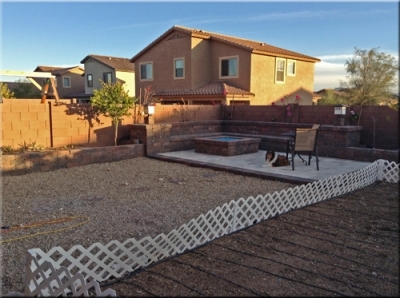 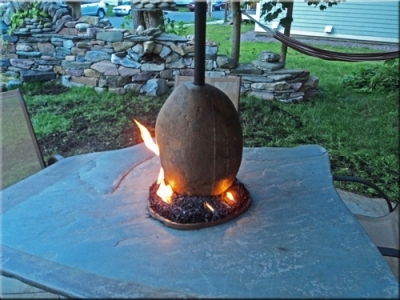 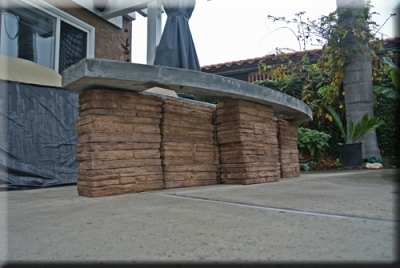 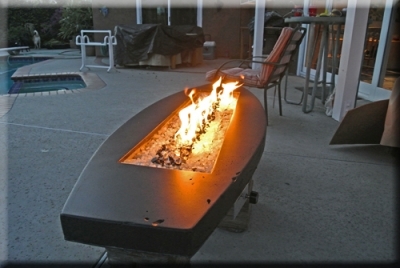 The Liptack's from Arizona had a modern backyard fire pit that needed some help. 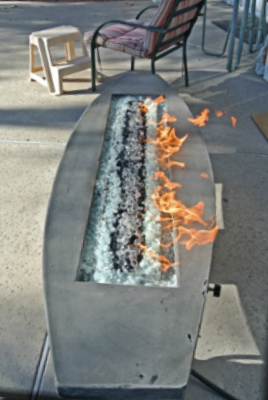 They wanted to make sure they'd have a clean burn so we provided the propane system along with flex hoses, mounting brackets, outdoor stainless steel linear burner and 48" Propane Hose with Regulator. 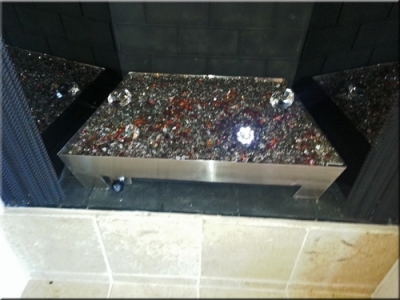 They topped it all of crushed lava, 1/4" Black and Iridized Scarlet ED Diamonds. 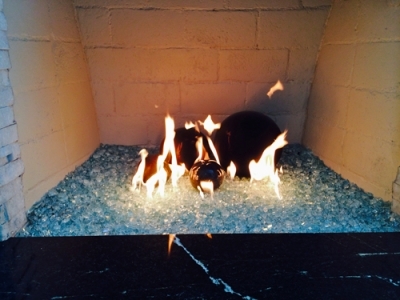 Ty Havas didn't want the ordinary Propane pan for his fireplace. 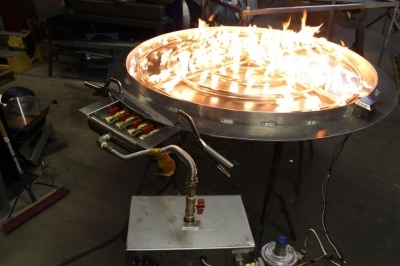 He wanted a pan that would be more than functional. 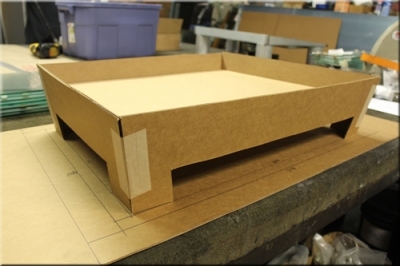 So after some sketches and discussions we began making a cardboard mock up. 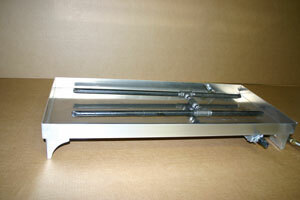 He would ultimately receive a Stainless Steel pan with angled legs and 3 inch depth to accommodate the burner and fireglass. 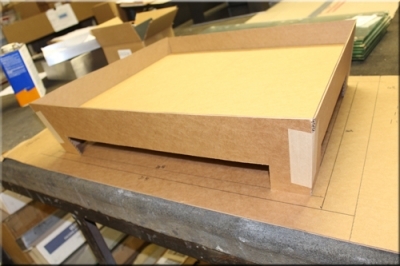 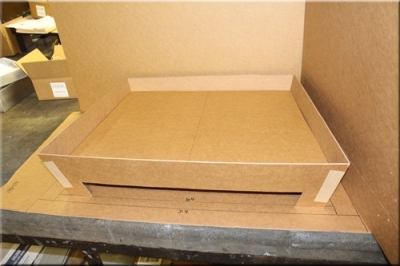 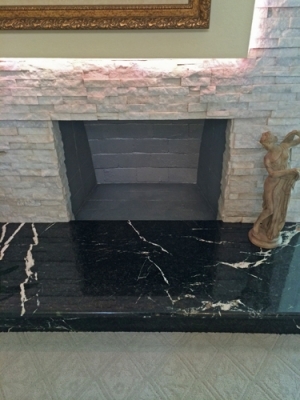 Here the cardboard mock-up along with his fireplace measurements (which you can see denoted on the cardboard piece below the mock-up) assure that we attain the correct size and appropriate design. 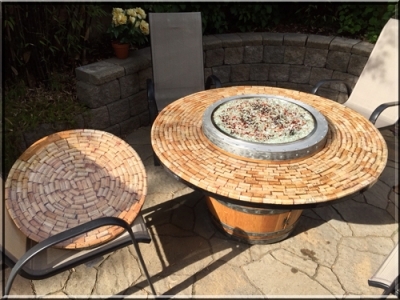 The custom stainless steel pan is filled 1/4" Bronze, 1/4" Bronze Reflective, Copper Ruby Red, Yellowish Opal Orange, and Red Brown. 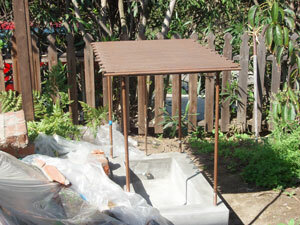 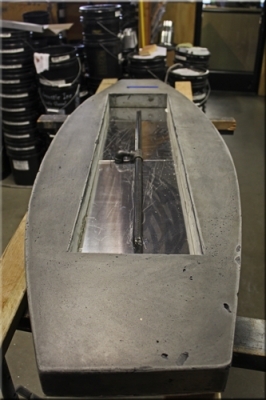 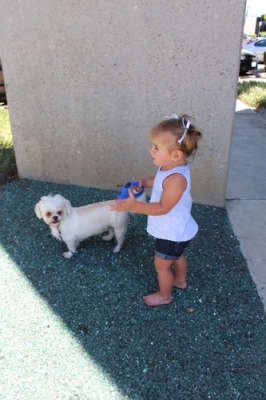 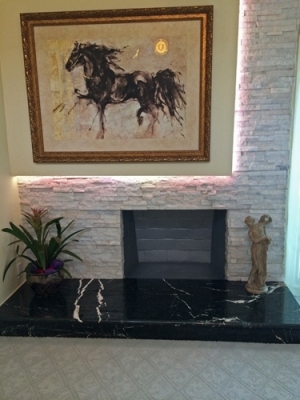 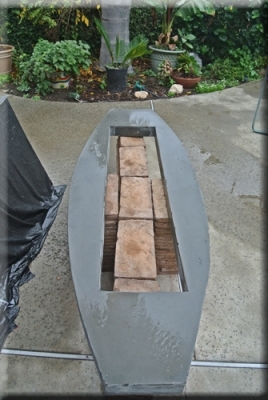 This custom concrete top was built by our customer Tim Masloski. 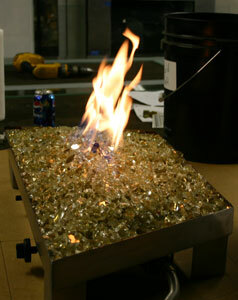 And though it looks amazingly cool; it was also amazingly heavy! 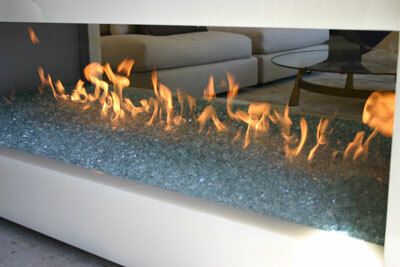 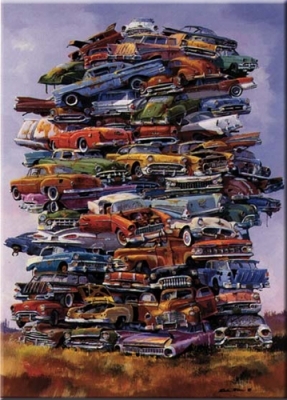 Like Enrique Castro, the design superseded the the functionality of the piece. 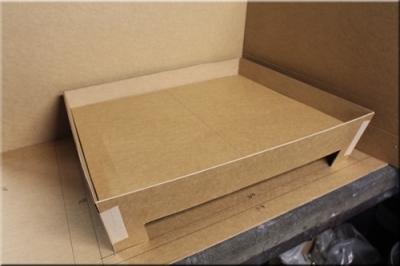 The 3" thick top could have been 1" thick with a form underneath. 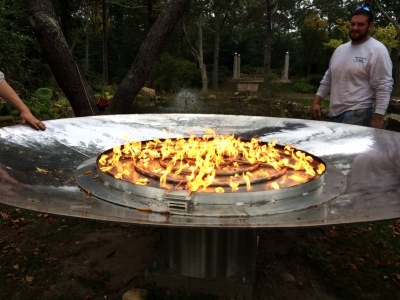 Tim brought in the piece, and we went to work installing our custom propane burner system with an aluminum base, 38" linear Burner, Thermocoupler/pilot system, 100,000 BTU regulator and 15' quick disconnect hose. 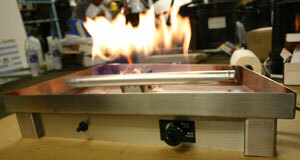 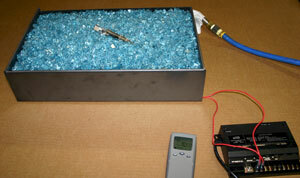 We test the flame output, on both high and low settings to make sure the burner works properly. 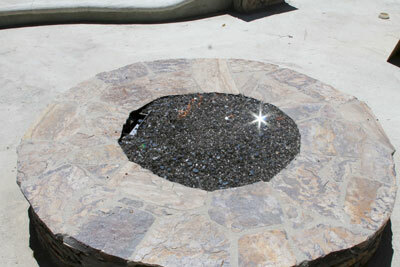 The media was 3/16" Clear, Super Black, Clear Blocks with gravel as filler. 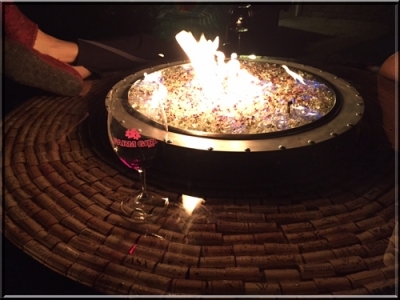 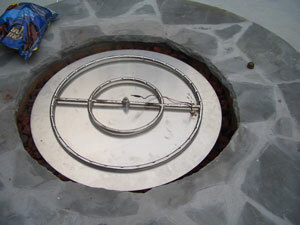 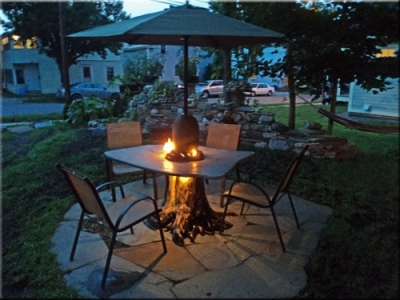 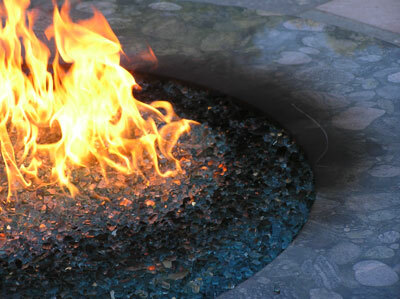 Brian Jensen's propane fire pit, with a 36" square pan and 24" Stainless Steel double fire ring under a combination of 1/4" Azurlite and 3/8" Azurilte. 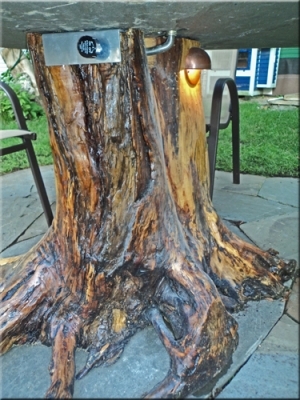 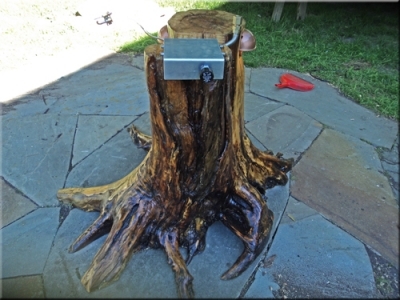 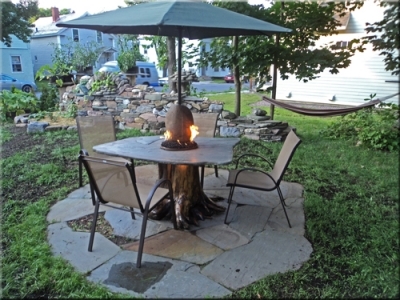 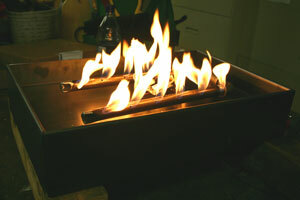 Michael built this awesome propane fire table with a tree trunk base. 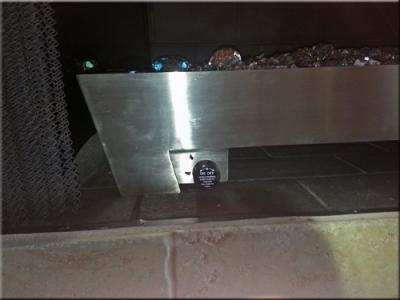 Below the propane Valve and air mixer is installed below the table top; allowing for easy access while keeping it out of sight. 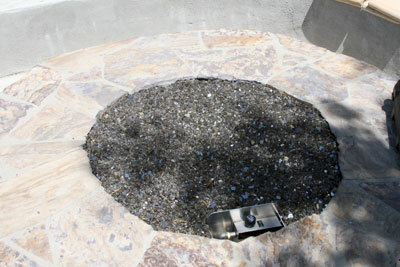 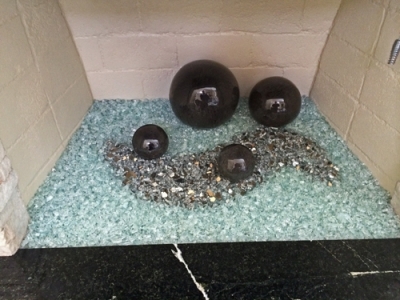 A 10" Stainless Steel Center-less ring surrounds his unique rock center piece which sits a-top our crushed lava rock. 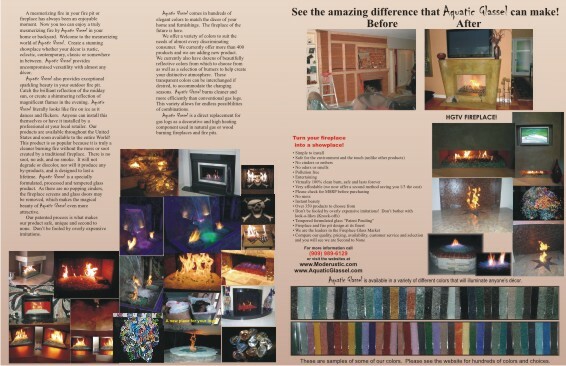 Check out Michaels website to see more of his custom work. 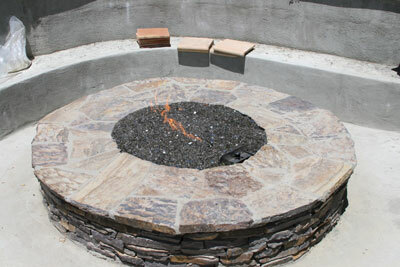 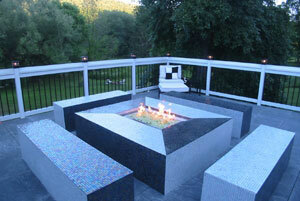 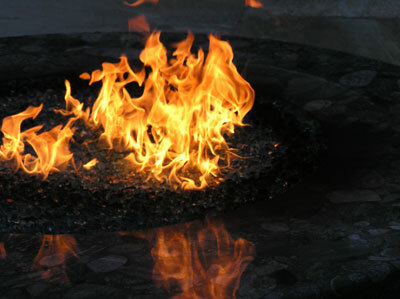 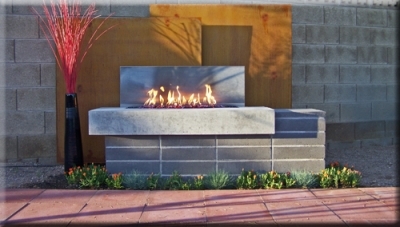 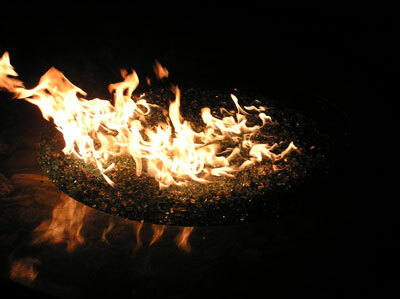 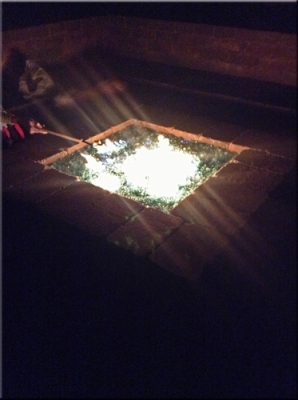 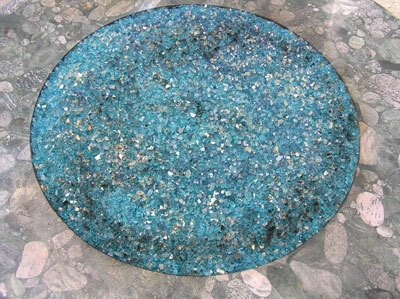 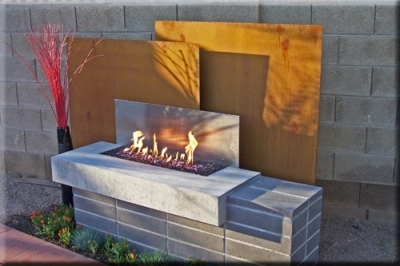 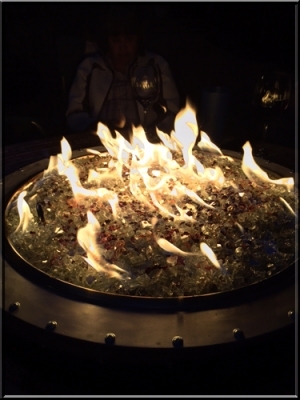 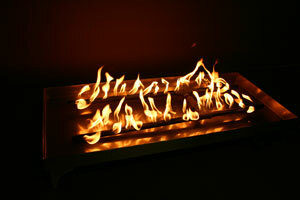 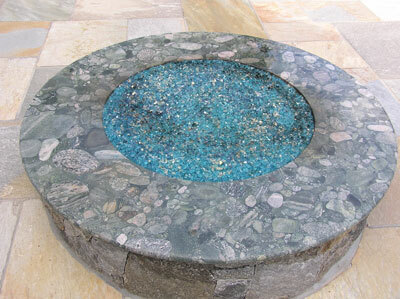 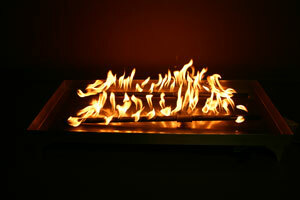 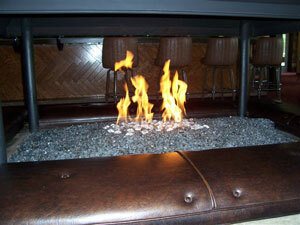 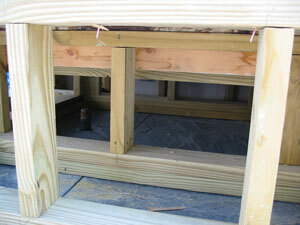 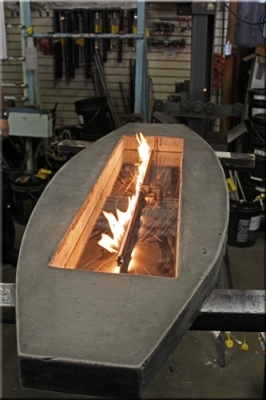 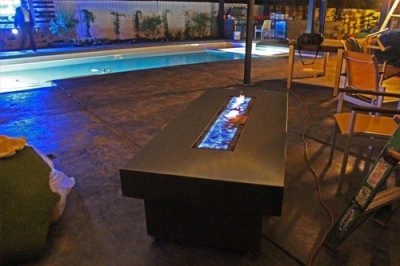 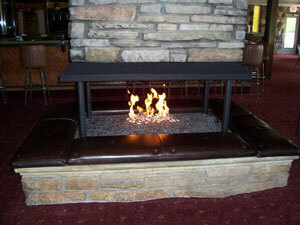 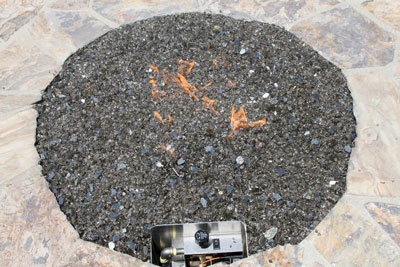 The fire pit table is at the Roxbury Hotel and we will show you the process from beginning to end. 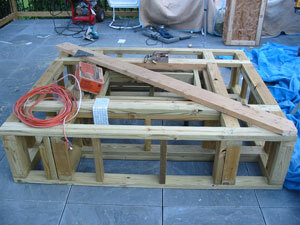 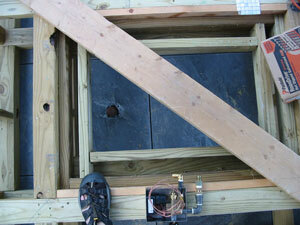 We start with the framing and making sure we understand how the gas line comes in and out out of the floor.